Get a physical. Be aware of any health problems that may exist. It's better to know. Make sure it's ok for you to exercise. Write down all the reasons why it's so important for you to quit smoking. The more emotional, the better. ("I don't want my kids to watch me die of lung cancer" for example.) Write your reasons down on a few 3x5 cards and carry them with you. Put them up where you will see them. Read them several times a day. Change your diet. Since nicotine acts as an appetite suppressant, you don't want to gain a weight after you quit smoking. (Very common after people quit smoking.) Start to eat three healthy meals a day with healthy snacks in between. Increase protein and reduce refined carbs. Use the nicotine patch, gum or prescribed smoking cessation meds if you need to, they are much more effective when used in combination with the techniques I'm giving you here. Use affirmations. Use positive self-talk such as "I am free!" or "I can do this" or "I am in control" or I'm worth taking care of " or "I am healthy, happy and free from addiction." Make it a habit to say them several times a day. After you quit smoking, avoid drugs like alcohol and marijuana which can decrease your motivation. I suggest giving them up at least for the first month of being a nonsmoker, longer if they are major triggers that make you want to smoke. If coffee makes you want to smoke, cut down or eliminate it for a while. Get lots of sleep. Your body needs energy to heal. Get your teeth cleaned and get checked for oral cancer. DON'T KID YOURSELF! Don't even think for a second that you can have "just one" after you quit. Chances are you can't. "Just one" can undo all of your hard work. Begin to see cigarettes for what they are: a deadly poison that you want to avoid at all costs. 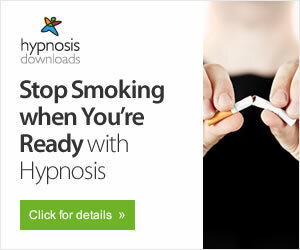 Hypnosis was found to be more than twice as effective as quitting "cold turkey," and over three times as effective as nicotine replacement therapy, according to a a study presented October 22, 2007 at the annual meeting of the American College of Chest Physicians. Your health is the most precious thing you have. Safeguard it by starting your plan to become smoke free today!